McAfee is an American company with a global outreach. Since 1987, at the Californian headquarters the founders of McAfee have been striving to bring the best computer security software to the consumer market. It is now the largest company dedicated to security technology. McAfee software is suitable for the workplace, public libraries, schools, universities and the home. It offers a series of products that are tailored for different types of usage, and for single as well as multi-usage. From governments to family users; from start-up companies to multi-nationals, McAfee customers the world over trust the brand’s software to keep them secure. In an age where hacking, identity theft and fraud are all prevalent problems of our online lifestyles, having your devices protected by security software is a necessary investment. McAfee’s computer security software has a tiered range of products, starting with the basic Antivirus Plus, which has a social media guard, and home network protection. If you want to cover a range of devices for multiple users, you may want to consider getting an expansive package like the LiveSafe which can be used to protect 5 users. How do I use my McAfee Promo code? Go onto the McAfee website and pick your software. When an offer is in place, your discount will be automatically applied before you go through to the payment procedure. Follow the proceeding instructions and insert your code if prompted elsewhere in the booking process. Check the social media channels for flash sales and special offers. How do I renew my McAfee subscription? On your My Account page, select My Account, and then click Subscriptions. Click View Active to see your subscriptions that have not yet expired. Look for the subscription you want to renew and click Renew. Can I get online McAfee technical support? Yes, go to this page and select the type of support you require. Can I read up on McAfee news? Yes, you can read up on the company news and wider industry news via this page. Delivery couldn’t be more simple - you don't need to wait for any disk or boxed goods, you'll receive an instant email with a code and instructions to begin your instant download. You can cancel your subscription within 60 days of purchase or renewal by contacting Customer Service. If you cancel your subscription more than 60 days after purchase or renewal, you are not entitled to a refund for any fees that you may have paid in advance for the current term, and you will remain liable for all fees. 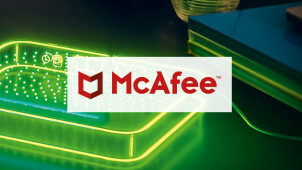 McAfee is a leading retailer of digital security products for computers, tablets and phones. Use a McAfee promo code to save yourself money on antivirus software that’s easy to install and will take a weight off your mind without denting your bank balance. Once you start using McAfee as your go-to security software provider, you’re bound to feel safer whether you use your devices for work or personal use, and upgrades are simple to install so you can scale up when necessary. McAfee offers a really handy comparison page on the website, so you can analyse the features of each software package to work out what’s going to be perfect for your specific needs before you buy. Browse the handy table to see if there’s a green tick next to all the features you want. Antivirus Plus is the most basic package, whereas you’ll notice that LiveSafe is at the other end of the spectrum, offering you access for 5 users and Secure Cloud Storage. McAfee is always coming up with great new products for a broad range of devices, which is why you’ll now find McAfee Mobile Security products that’ll keep your smartphones and tablets safe. If you see some McAfee discount codes, we’d suggest you dive straight in and make savings on a package that’s going to ensure your devices are protected. Benefits include; File Lock, Parental Controls, Social Media Guard and Home Network Protection.